Macular atrophy is a manifestation of Stargardt disease (STGD) and of age-related macular degeneration (AMD) . STGD is the most common inherited macular dystrophy in both children and adults, caused by pathogenic variants in the ABCA4 gene ; whereas AMD is a multifactorial disease and the leading cause of blindness in the elderly . 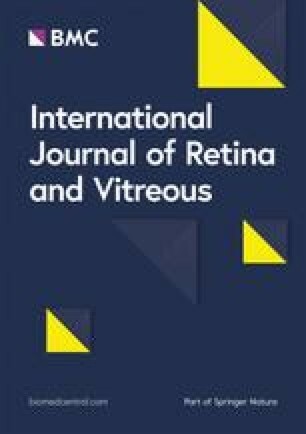 Many factors are known to be associated with the physiopathology underlying the development of retinal pigment epithelium (RPE) atrophy in patients with STGD and AMD, and there is evidence that the toxic accumulation of lipofuscin and its bis-retinoid components, including N-retinylidene-N-retinylethanolamine (A2E), play a role in both conditions [4, 5, 6]. The A2E accumulates in the RPE and photoreceptors, leading to the degeneration of these cells [4, 5, 7]. Clinically, STGD and AMD also share common features, such as decreased central vision, bilaterality, and macular atrophy. In STGD, the macular atrophy is usually symmetric and may be accompanied by flecks [8, 9]. Two prognostic factors have been associated with disease progression: fundus autofluorescence (FAF) and full-field electroretinogram (ffERG) patterns at baseline [10, 11]. Patients with multiple and widespread lesions on FAF and with cone-rod dysfunction on ffERG tend to exhibit a more severe phenotype than do those with localized macular changes and normal function of rods and cones [10, 11]. In AMD, on the other hand, patients most commonly present with drusen and pigmentary changes and develop macular atrophy (dry AMD) and/or choroidal neovascularization (wet AMD) over time . In AMD, three major factors have been associated to the disease progression: the presence of large drusen , large drusen areas, and pigmentary changes [12, 14, 15, 16, 17]. In AMD, pigmentary changes either consist of hypopigmentation represented by depigmented areas not related to geographic atrophy or by hyperpigmentation represented by deposits of gray-black pigment on the fundus exam [12, 18]. The hyperpigmentation is thought to result from RPE degeneration, displacement, or migration [19, 20, 21]. Clinical studies have corroborated this theory by demonstrating a correlation between pigment clumping observed on color fundus photography (CFP) with hyperreflective foci in several retinal layers, including the outer nuclear layer (ONL), outer plexiform layer (OPL), and inner nuclear layer (INL) on spectral domain optical coherence tomography (SD-OCT) [22, 23]. Although the association of hyperpigmentation with disease etiology in AMD has already been described, to our knowledge, the presence and significance of hyperpigmented changes and associated RPE changes in patients with STGD are still poorly defined. 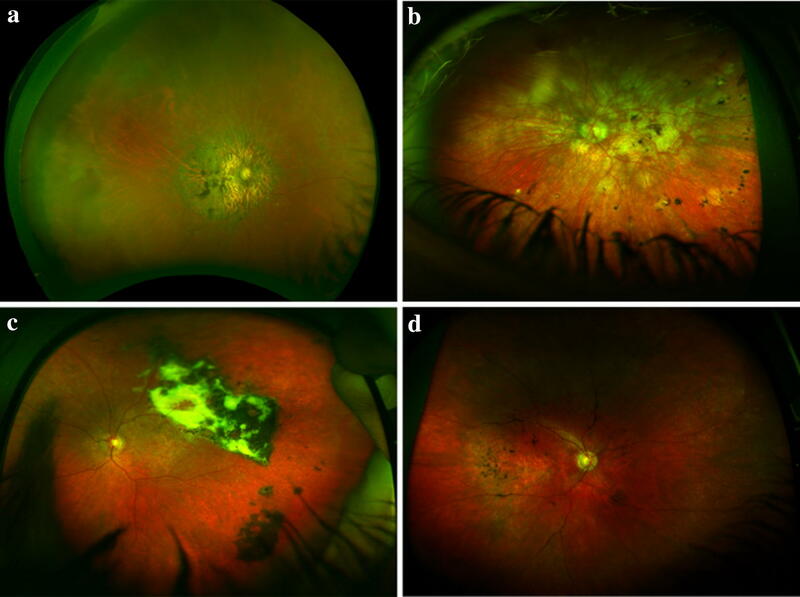 The aim of this study was to better characterize macular hyperpigmentary changes in patients with STGD and investigate the association of this finding with the severity of the clinical phenotype. 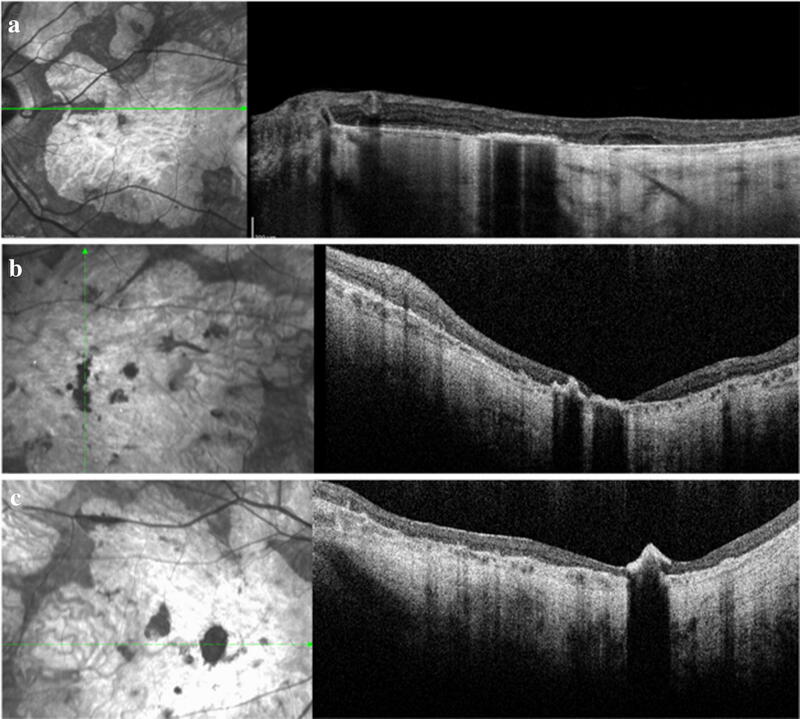 We also provide some preliminary follow up data, which includes a comparison of the visual acuity at baseline and follow up, and the progression of both the number and density of macular hyperpigmentary changes on color fundus photography and migration from outer to inner retinal layers on SD-OCT. In patients with STGD, hyperpigmentation has been described following human embryonic stem cell-derived RPE (hESC-RPE) transplantation. In most eyes, hyperpigmentation was observed as subretinal hyperreflective foci at the border of atrophic areas, consistent with location of hyperpigmentation in the RPE-transplanted cells [25, 26]. In a few eyes that underwent hESC-RPE transplantation, a patch of epiretinal pigmentation also developed, which likely resulted from a reflux of the implanted material from the subretinal space or from injection into the pre-retinal space [25, 26]. In retinal dystrophies overall, RPE proliferation seems to occur in response to loss of surrounding RPE cells, which in turn leads to further retinal cell damage and loss [27, 28]. In our study, hyperpigmented lesions increased in size, spread across the retina, and migrated to different retinal layers over time. Therefore, it is possible that, similar to the pathogenesis of hyperpigmentation in patients with AMD and other retinal dystrophies, the hyperpigmentation observed in patients with STGD may also occur in response to loss of surrounding RPE cells, which in turn leads to further RPE damage and loss [27, 28], resulting in RPE degeneration, displacement and migration [19, 20, 21]. In AMD, macular hyperpigmentation occurs after extensive loss of the RPE and increases the risk of progression to either geographic atrophy or choroidal neovascularization . Comparisons have been made between patients with AMD and STGD in part due to the similar pathogenesis that characterizes these degenerative diseases [4, 5, 6]. Interestingly, the presence of a single heterozygous mutation in ABCA4 has been associated with an increased risk for AMD . Considering that the use of RPE stem cell therapies are being investigated for both of these diseases, and that pathologic RPE remodeling is an important disease mechanism in both diseases, a robust understanding of RPE remodeling is necessary to anticipate possible outcomes for patients with STGD who undergo a therapeutic intervention. In STGD, macular hyperpigmentation may not be predictive or causative of a severe phenotype, but it may be a finding associated with an advanced stage of disease, after extensive photoreceptor degeneration and RPE atrophy have occurred. The relationship between RPE atrophy, photoreceptor degeneration, and RPE remodeling in both of these macular diseases may elucidate more about the etiology of macular hyperpigmentation and lead to potential treatments that might reverse the pathologic remodeling seen in these degenerative retinal diseases. The limitations of this study include its retrospective design and limited number of visual functional tests. The absence of change in VA between baseline and follow up visits may have occurred because patients with STGD are known to have oscillation of the preferred retinal locus and have also been shown to reach a relative plateau in visual acuity at 20/200 [30, 31, 32, 33]. In addition, in many cases, the areas of hyperpigmentation were outside the fovea, and, therefore, the effect of the lesions on visual function could not be evaluated only by measuring the central VA. The areas of geographic atrophy were also subjectively quantified, and, therefore, the association between progression of geographic atrophy and development of hyperpigmentary changes cannot be established.